Like all living creatures, hamsters are capable of experiencing a number of ailments as they age. Although strokes are not common, they do occur among the hamster community, mostly during the evening hours when the hamster is very active, according to the Popular Pets website. Some hamsters may recover from a stroke quite rapidly on their own, but others may need assistance from their owner for several weeks. One of the most common symptoms exhibited by rodents that have had a stroke is the presence of a head tilt. Not to be confused by an ear infection, the head tilt is usually a permanent side effect of the stroke, according to the Pet-Zone website. Hamsters can live with a head tilt as long as more severe physical and behavioral changes are not present. The neurological damage that accompanies a stroke can cause mental confusion and a loss of equilibrium in the hamster. Hamsters that have had a stroke are often seen walking or running in circles and, in more extreme cases, falling over repeatedly. 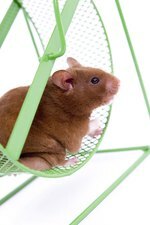 Removing common items, like exercise wheels and wooden toys, from the hamster's habitat will help prevent more injury. Similar to cases of human stroke, hamsters may experience paralysis after suffering a stroke. Only time will tell if the paralysis will be permanent or not, and it may take several weeks before the hamster is up and moving around again on its own, according to the Hamsterific web site's illness guide. Until that time, it may be necessary for the owner to hand-feed and water the hamster so that it does not become malnourished and/or dehydrated. Prior to the actual stroke, the hamster may exhibit sudden and extreme exhaustion, potentially collapsing after some activity. The hamster may also suddenly become very still and appear to be in a trance-like state, staring into the distance and not responding to its surroundings, according to the Hamster-Club.